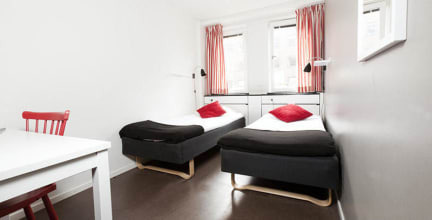 STF Gardet - Stockholm is located in a large residential district and is also very close to many foreign embassies. I stayed at STF while visiting friends who live nearby. It was well worth the price for having a private room/bathroom. The entire facility was extremely clean and quiet. Front desk staff, Marie, was very helpful in making recommenations about things to do in Stockholm. Excellent staff, everyone were very friendly and helpful. The facilities are excellent, cant expect something better. Not a hostel with "backpackers" atmosphere, but I wasnt looking for that, so for me was perfect. Location for me was very good because it was a nice place but outside the crowded city centre. It takes around 20min by walking to get to the start of the city centre or by bus 8min aprox. There's nothing wrong with this hostel. Clean, attentive staff, good price. It's just not an ideal location when visiting Stockholm for the first time. You have to walk half a mile to the nearest Metro, a mile to the museum area, and it's mostly residential. I didn't find that there were good restaurants nearby either. So depending on what your purpose is, I'd recommend staying in other parts of the city.